"You have four days to get the boy back." Southern filmmaker Jeff Nichols has quickly proven himself a mature and enigmatic cinematic storyteller. Midnight Special, his latest and fourth feature, continues a strong streak of moody, thoughtfully gothic dramas about unique character relationships and fatherhood told with tinges of parable storytelling and wrapped in a healthy layer of mystery. 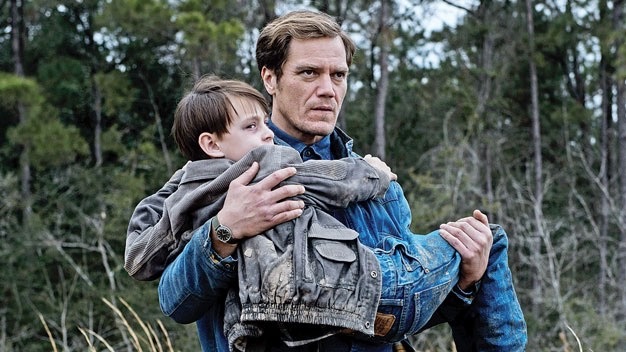 Michael Shannon, who has appeared in every single Nichols film to date, stars as Roy the father of Alton, a special eight-year-old child with mysterious, supernatural powers, played ably by St. Vincent actor Jaeden Lieberher. The film and action start mid-story forcing viewers to immediately pay attention and catch up to the complex narrative from behind. Joel Edgerton is serviceable but mostly in the background as Lucas, Roy's accomplice, helping him, Alden, and Alden's mother, Sarah, played by a low-key but emotional Kirsten Dunst escape. Adam Driver offers a turn nice as an NSA agent tasked to analyze Alden's powers and visions while adding some welcomed comedic elements and serving as an audience surrogate to marvel at Alton's power. An always stoic Sam Shepard shows up in a small but key role as the cult leader who worships and harbours the boy before Roy takes him back. Nichols mixes so many interesting dramatic influences from Spielberg's Amblin era films revolving around children and alien powers to chase and road trip elements from the heyday of family-friendly adventure films. Things are constantly moving forward as the film has a remarkably assured hand and focus throughout balancing vague mysteries with a sense of wonder rather fluidly. However, much will be made of the film's finale and sharp, unexplained narrative turn to a somewhat dissatisfying conclusion, mirroring fantastical elements reminiscent of Tomorrowland, depending on your appetite for an open-ended mystery. Midnight Special is an energetic, coming-of-age thriller full of genuinely sparkling performances and a refreshing retro modern aesthetic. Nichols and Shannon continue a fruitful and rewarding dramatic collaboration on screen as the pair and company have crafted a worthy story filled with weighty themes about childhood and the power of parental love.